The USS YOSEMITE (AD-19), a Dixie class destroyer tender, was commissioned on 26 MAR 1944. USS YOSEMITE served her country for 49 years, 10 months and 1 day, until decommissioned on 27 JAN 1994. Built by the Tampa ship Building Co., USS YOSEMITE transited the Panama Canal in August 1943 and joined the fight against the Japanese in the Pacific. First in Hawaii, then Eniwetok, Ulithi, the Philippines, and finally in Saesbo, Japan, YOSEMITE tended the fleet through the war effort and their return to the US. Returning to the East Coast after the war, she began a long career of Mediterranean deployments and participation in the Cuban Missile Crisis and the Gulf War. Decommissioned in 1994, YOSEMITE sat idle at Naval Inactive Ship Maintenance Facility, Ft. Eustice, VA until 18 November 2003, when she was sunk as a target during fleet exercise. The third Yosemite (AD-19) was laid down on 19 January 1942 by the Tampa Shipbuilding Co., Inc., at Tampa, Fla.; launched on 16 May 1943; sponsored by Mrs. Melville W. Powers; and commissioned on 25 March 1944, Capt. George C. Towner in command. Between late March and mid-June, the destroyer tender was fitted out at Tampa. On 21 June, she got underway for the Virginia capes, steamed via Key West, and arrived at Hampton Roads on the 26th. For the next 10 days, the destroyer tender conducted shakedown training in Chesapeake Bay and then put into Norfolk for additional outfitting and some modifications to her below-deck spaces. Early in August, she made a voyage to Fort Pond Bay, N.Y., to load torpedoes. On the 6th, she headed south to Guantanamo Bay and thence proceeded to the Canal Zone, transited the Panama Canal, and arrived at Balboa on the 13th. From there, the ship continued her voyage west to Hawaii and arrived in Pearl Harbor on 29 August. As soon as she moored, Yosemite went to work. For the next six months, the ship's company made repairs on over 200 ships. She remained at Oahu until February of 1945. On the 15th, she exited the harbor and set a course for Eniwetok Atoll in the Caroline Islands. She arrived there on the 22d but remained for only five days before moving farther westward to the forward base at Ulithi Atoll. She entered the Ulithi anchorage on 3 March, and her crew set again to work repairing the veteran ships of the war in the Pacific. On 25 May, Yosemite departed Ulithi in a convoy bound for Leyte Gulf in the Philippines. She arrived in San Pedro Bay on the 28th and resumed her work supporting the Fleet in its march toward Japan. She remained at Leyte through the end of the war but, soon thereafter, got underway for Japan. The destroyer tender arrived in Sasebo on 22 September and began tending ships assigned to the occupation forces in the Far East. That assignment lasted until March 1946. On the 15th, she stood out of Yokosuka on her way home. Yosemite transited the Panama Canal in mid-April and arrived in New York on the 22d. Soon after her arrival back in the United States, Yosemite became the flagship for the Commander, Destroyers, Atlantic Fleet. Except for several brief interruptions for shipyard overhauls, she served in that capacity from 17 June 1946 until the suring of 1962. During that 16-year period, she spent most of her time in port at Newport, R.I., though on occasion she did make voyages to the West Indies. In addition, near the end of that stretch of time, the destroyer tender made two overseas deployments. In June 1958, she voyaged to northern Europe for the purpose of tending ships engaged in an exercise in the North Atlantic. Later, on 17 March 1959, she again departed Newport for a brief tour of duty tending the ships of the 6th Fleet. She concluded that assignment when she returned to Newport on 24 July and resumed duty as tender to the Atlantic Fleet destroyers and as flagship for their type commander. 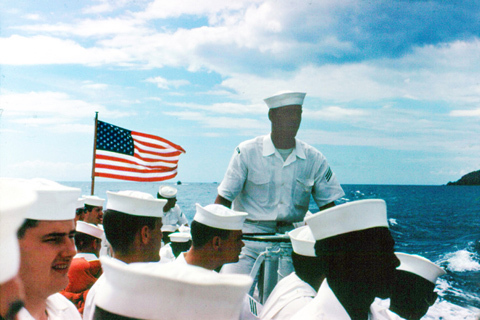 On 1 April 1962, Yosemite's role changed somewhat when the Atlantic Fleet cruisers and destroyers were brought together into a single type command. At that time, she became flagship for the new command, Cruiser-Destroyer Force, Atlantic Fleet. Late that fall, during the Cuban missile crisis and the American quarantine of the island, Yosemite departed Newport for a time and headed south via Norfolk to Kingston, Jamaica, where she tended the ships engaged in that operation. In December, she returned to Newport and resumed her normal schedule. Over the next six years, the destroyer tender remained at Newport except for occasional overhauls and for short voyages to the West Indies early each year to tend Atlantic Fleet ships participating in the annual "Springboard" exercise. In 1969, the complexion of her operations changed somewhat. In April, she resumed overseas deployments after a hiatus of 10 years. She departed Newport on 7 April and arrived in Naples on the 19th. During that tour of duty in the Mediterranean, she served as flagship for the Commander, Service Force, 6th Fleet. Grand Canyon (AR-28) relieved her of tender duties on 14 August, the Service Force commander shifted his flag to Mississinewa (AO-144), and Yosemite sailed for the United States on the 15th. On the voyage home, she took on board a badly burned West German seaman from SS Sinclair Venezuela and transported him to the naval hospital at Newport. On 24 October, Yosemite's home port was changed from Newport, R.I., to Mayport, Fla.; and the destroyer tender got underway for that city three days later. The ship arrived at Mayport on the 30th and began tending ships. Since that time, Yosemite has been based at Mayport. She has served as flagship for various units of the Cruiser-Destroyer Force, Atlantic Fleet-notably Cruiser-Destroyer Flotilla 2 and Cruiser Destroyer Group 12. She has also made two additional deployments to the Mediterranean, one from July to December 1974 and the second from September 1977 to March 1978. She resumed tender duties at Mayport on 12 March 1978 and, as of October 1978, was engaged in those duties.